The laws are outlined by US Code, specifically Title 35: Patriotic Societies and Observances, Chapter 10 Patriotic Customs. The proper way to treat flags were codified in 1931. Many people who hang the flag at all times don’t realize that flags should be raised by night, and others may think that shining a light on the flag during darkness will raise their utility bills. 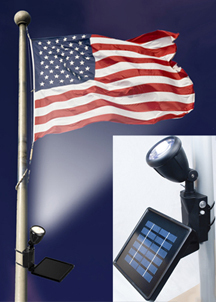 Solar flagpole lights let you economically display you US flag at night to follow tradition and US Codes. “It is the universal custom to display the flag only from sunrise to sunset on buildings and on stationary flagstaffs in the open. The US President and governors of US states can also proclaim days that flags should be hung or days on which the flag should be hung at half mast, such as when a national hero, former president or other noted dignitary passes away, or following natural or man-made disasters. So, raise your flag and if you like, keep it up at night and show it the proper respect with an economic solar light. The cost of appropriate lights are no more than any other light, but there much easier to install (no wiring!) and won’t add one cent to your utility bill. Also, may everyone have safe and happy spring and summer holidays, and remember to give thanks to our Veterans and active servicemen and women! This entry was posted in Other Things We Like, Seasonal, What's New by SolarLightingSmart. Bookmark the permalink.